I’ve worked at Legacy.com for more than 10 years. A little while back, my supervisor and I figured out that over the course of those 10 years I’ve reviewed more than one million Guest Book entries. One million! I’ve seen condolence messages in so many different forms, you’d think I’d be a Guest Book expert – and you’d be right. I can easily tell you if an entry is appropriate based on our guidelines, or if it’s inappropriate, or if it depends on context and situation. But you know what I can’t do? Write a Guest Book entry. It’s unbelievably hard for me. Even after seeing more than one million entries, when I need to give my condolences to a friend after the death of their loved one, the words just don’t flow. I can sit there staring at that blank text box for what feels like hours, and still not feel like I know the right thing to say. And I’m not alone. A note of condolence – even a short and sweet one – is one of the hardest things in the world to write for lots of people. Coming up with the perfect words can feel so important that it just stymies us. We stare and stare, and some of us eventually just give up and sign our names only – or don’t sign the Guest Book at all. But our condolences are really important to our friends and families. Here at Legacy.com, we hear it over and over – our customers are so grateful for the messages they receive from others. Even just the short and sweet sentiments, even just the names, show that their friends care about them and mourn their loss. That feedback from our customers reminds me not to give up on writing my entry when the time comes – I know my words will mean a lot. For those who can’t think of what to say, we have an alternative to giving up. 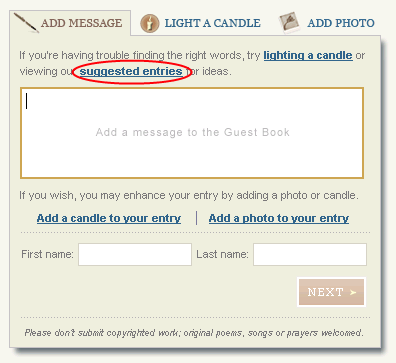 That’s our selection of suggested entries: a variety of entries that are pre-written to help make the Guest Book entry submission process less intimidating for folks whose words elude them. Once you click that link, you’ll see a section that allows you to select the sentiment that feels right for you. You can choose from several categories – there are general condolences, sentiments from an individual or a group, and a wide selection of poems. Each category includes a variety of entries. Once you find the selection that best says what you want to express, you can choose to fill in your name, city and state (all those are optional). Then just click “Next” for a preview of your entry, and “Submit” if you’re satisfied with its appearance. Once you submit your entry, you’re all set! The entry will go to our screeners for review (even though the text of your entry is pre-written, we do still need to check name and city for appropriate content) and will be posted within a few hours. When we debuted our selection of suggested entries a few years ago, we weren’t sure what Guest Book signers would think. Would they use them, or would they prefer to struggle for their own words (or give up and skip writing at all)? What we found was that while the majority of people still compose their entries, a fair number of people seem grateful for the assistance that our suggested entries provide. We see many of these entries used every day. It feels good to have found another way we can help people at one of the most difficult times. Every suggested entry that’s posted has the chance to help a family that really needs to hear those kind words. So the next time you need to sign a Guest Book, if that blank text box feels daunting, take a look at our suggested entries and see if one of the sentiments expresses what you’re trying to say. To read more tips on signing an obituary Guest Book, see our collection of guides – How to write a condolence letter. 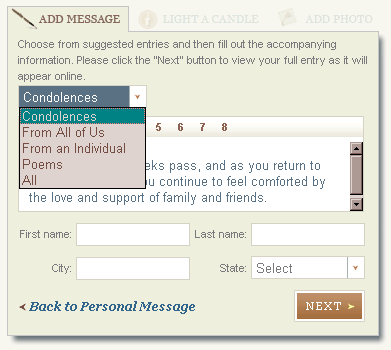 This entry was posted in How to write a condolence letter, Legacy.com Guides and tagged Condolences, Guest Book entries, How to write a condolence, Life at Legacy.com, Obituary Guest Books. Bookmark the permalink.